President Bush’s announcement today that his administration will begin implementing a set of punitive measures — its oft-threatened “Plan B” — against the Sudanese Government could have marked a real turning point in U.S. policy to end what the president calls genocide. Unfortunately, it doesn't. With international diplomatic efforts to halt atrocities in Darfur at a standstill, the President announced three measures intended to change the calculations of the regime in Khartoum and intransigent rebel leaders. First, the U.S. will add 31 Sudanese companies to a list of 130 that are already denied access to the U.S. financial system. Second, the U.S. will freeze the assets of three of the many individuals responsible for the violence in Darfur. And finally, it will "seek" a resolution at the United Nations Security Council to impose targeted sanctions on individuals and expand an ineffective arms embargo that has been violated with impunity. Three people? After four years? And not one of them the real ringleader of the policy to divide and destroy Darfur? And once again the U.S. is going alone? This is not leadership. This will not create missing leverage. This will not build multilateral pressure. And this will not end the crisis in Darfur. What small steps that have been announced are largely due to tireless activism from concerned citizens, persistent efforts by members of Congress from both sides of the aisle pressuring the White House, and the president’s own demands for tougher policy options. However, the current Plan B is too unilateral in nature and much too weak to have an impact on the calculations of either Sudanese officials or intransigent rebel leaders. Unless the U.S. takes the decision to press hard in the UN Security Council for a meaningful resolution that sanctions the top ringleaders and multilateralizes the sanctions against the companies the U.S. has already sanctioned, there will be no bite to this endless barking. And the U.S. must begin to share significant declassified intelligence with the International Criminal Court to help accelerate the building of indictments against those most responsible for the obstruction and destruction in Darfur. Expanded unilateral economic sanctions and freezing the assets of three people will not alter the calculations of the Sudanese officials responsible for ongoing atrocities. The U.S. has been blocking transactions with the Sudanese Government and many Sudanese companies since President Clinton first imposed sanctions in 1997. Consequently, the Khartoum regime has had 10 years to develop its oil-driven economy outside the scope of U.S. sanctions, and therefore further unilateral U.S. moves are economically and politically irrelevant. Acting alone, the U.S. has very little leverage. Oil prices are soaring and Khartoum is booming. And the administration’s intermittent leaks to the press about Plan B squandered what leverage it might have built. 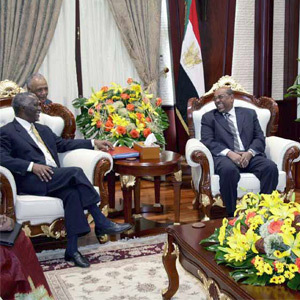 Khartoum was alerted and had ample time to prepare for any unilateral U.S. moves. Why is the U.S. acting alone? With U.S. diplomats scrambling with other serious crises — Iraq, Iran, and North Korea among others — the Bush administration has not yet decided to exercise the leadership necessary at the United Nations Security Council to secure the votes for tougher action on Darfur. France, Germany, and the UK are all on record in support of tougher sanctions, yet Plan B is largely a solo effort. As for targeting the individuals most culpable for atrocities, the current U.S. plan will impose sanctions on two senior government officials and one rebel leader. The more senior regime officials who masterminded crimes against humanity in Darfur can breathe easy. They have yet to pay a cost for those crimes. ENOUGH chronicled who these officials are in an earlier statement, "We Know Their Names." Multilateralized Sanctions Against Sudanese Companies Supporting the Regime: The U.S. should work with the UN Security Council to impose sanctions against the Sudanese companies already targeted unilaterally by the U.S. Unless the current U.S. list of 161 is made multilateral, these sanctions will be meaningless. A UN Panel of Experts should also be established to further investigate which companies are conducting the business necessary to underwrite Sudan's war machine. Pressure on International Banks to Stop Doing Business with Sudan: U.S. officials should engage with a number of international banking institutions to strongly encourage them to stop supporting oil transactions with Sudan, with the implication being that if such business continues, then all transactions conducted by those banks with U.S. commercial entities (and those of other countries willing to work with us) would eventually be banned. Reinforcement of Divestment Efforts: President Bush should sign an Executive Order putting into law all of the legally possible elements of existing Congressional bills in support of divestment. The executive should be supportive of efforts across the U.S. to pressure university endowments, municipal and state pension funds, and private mutual funds to sell equity holdings in a targeted list of companies whose business bolsters the operations of the Sudanese regime. Support for the ICC Indictment Process: The U.S. should provide information and declassified intelligence to the International Criminal Court to help accelerate the process of building indictments against senior officials in the regime for their role in orchestrating mass atrocities in Darfur. The U.S. has the most such intelligence and should come to agreement with the ICC about what information to share. Accelerated Credible Military Planning: The U.S. also should develop credible plans for decisive military action, not only to enforce a no-fly zone, but to protect civilians with ground forces without consent from Khartoum should all else fails. This military planning is both a practical necessity, and a means to build and utilize leverage against the regime. call on President Bush to put credible plans in place for a no-fly zone and non-consensual force deployment to protect civilians if the situation deteriorates in Darfur and the Sudanese regime continues to block the UN-led hybrid force.